Jenn L: We love your product. This is how quickly our flowers grew after just two weeks of using it. Chris B : This stuff is absolutely amazing! A few weeks ago I had to deadhead some plants because they looked awful. That was about the time I received this product and they already look like something amazing that came straight from a professional grower. I call it my "plant crack" and use it on everything now. Just bought more to stock up. I can't say enough good things about it! You guys rock! Sandy W: Best fertilizer I have ever used! A little goes a long way, and it is easy to mix & use. My plants are thanking me for it, I am having the best year ever. My tomato starts are only three weeks old and look like eight week plants. This is definitely a five star product! Jeanne L: Outstanding fertilizer, my plants are loving it and growing huge quickly. 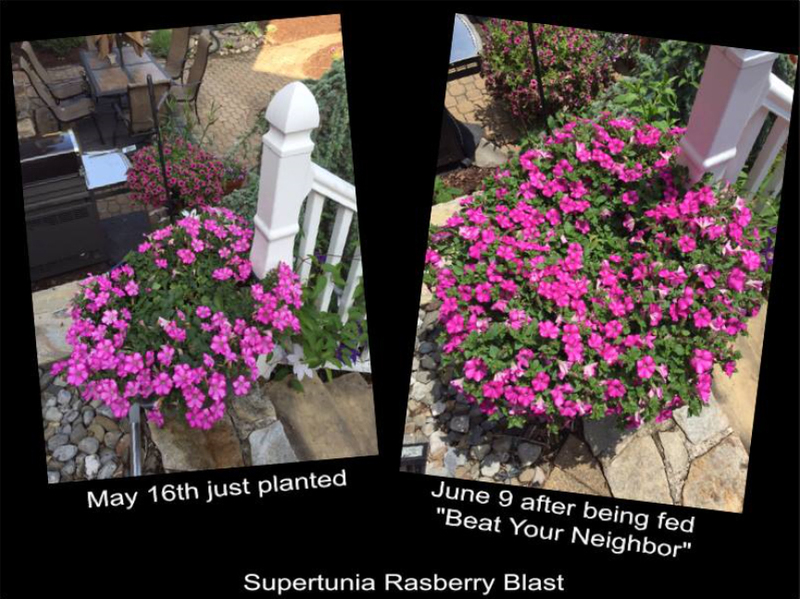 Brett P: I feed 1x a week with Beat Your Neighbor Plant Food & Fertilizer and you can see the results! You may be able to see the Pretty Much Picasso basket in the back as it has amazing results also. All my flowers do! Janice S: My geraniums look great! They were potted a little late in the Spring but have caught up and surpassed those that haven't been fertilized. Posh Little People Company: We had a chance to try Beat Your Neighbor Plant Food & Fertilizer and if you want big beautiful flowers, you'll head over there and get yourself a container! 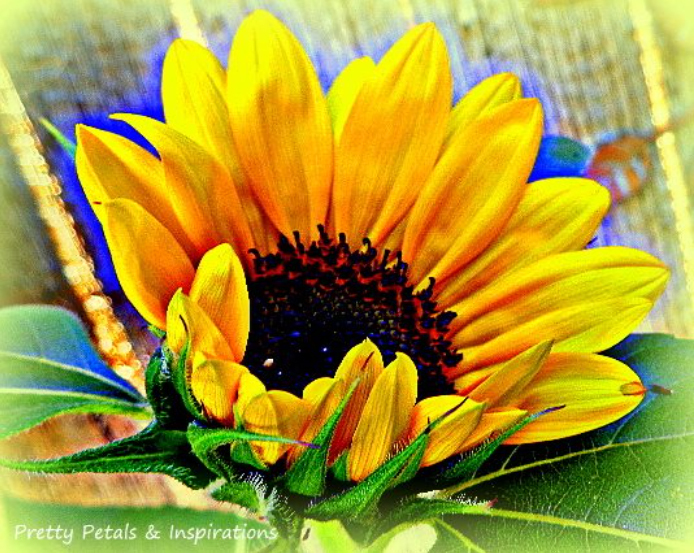 Pretty Petals & Inspirations (garden blog): I have Sunflowers everywhere! This is a miniature Radiant Sunflower - they usually get about 2ft tall...most of them are well over 3ft now! And are beginning to bloom already! - Much faster than usual! Sue S: Awesome customer service! I just ordered two more and they were shipped within the hour. This is such an amazing plant food. I have been using it faithfully all season and have literally seen my plants and flowers get bigger overnight. Even my husband noticed. It does take a little dedication and effort to constantly make up the batches to water my flowers, but it is so worth the effort and you will be amazed at the difference in your plants. You must, must, must give this a try! My hanging baskets are amazing. 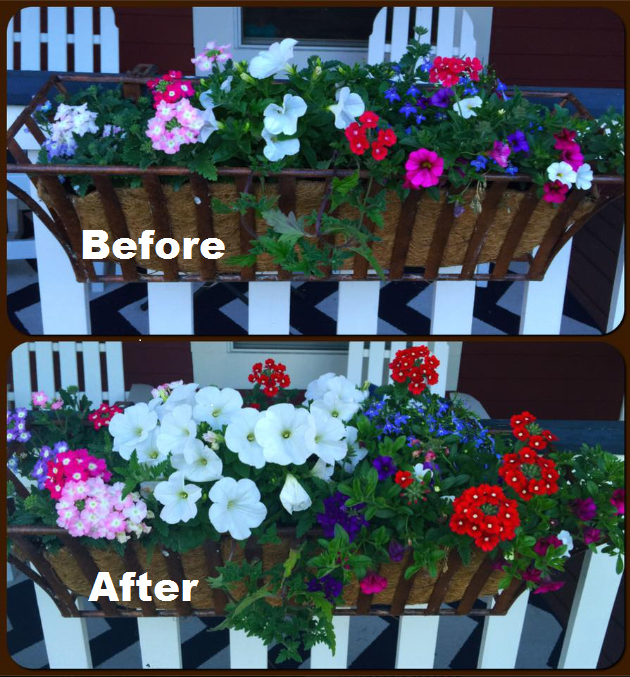 I will never go back to MG.
Jayne M: I used this on a customers beds (impatiens grown from seed and treated for Downy Meldew) and the impatiens have NEVER been bigger and more beautiful! WOW! I'm so glad I decided to try it. I'm ordering more so I don't run out. 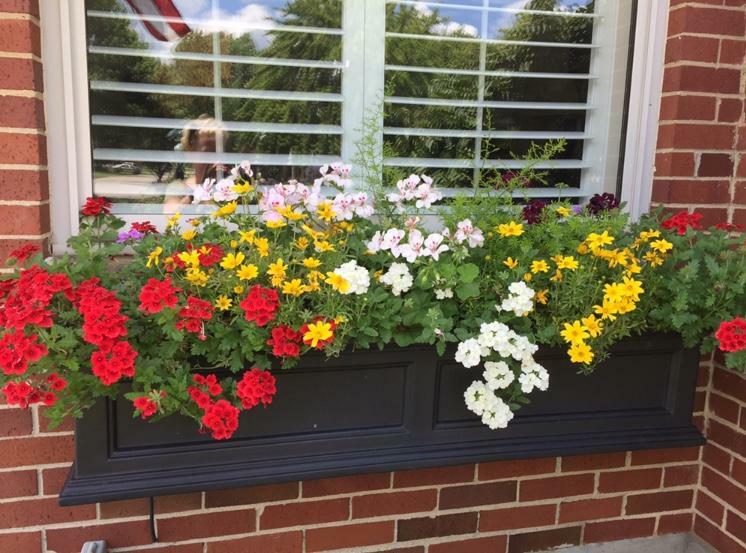 My containers, beds and window boxes are as lush as you can expect! Shelly R: Amazing stuff. Will not use anything else! I love the results! Val K: Best fertilizer I've ever used. The results are absolutely amazing! Betsy B: I looove this product. My flowers have been the prettiest they have ever been! Judy: I started using your product last summer after seeing an on-line advertisement. I’m an avid “Yard Nazi” and had just put in flower boxes all around my house. Let me tell you, those boxes were AMAZING all the way through the fall! The rest of my beds, pots and baskets were pretty outstanding as well. I used up my first order and then ordered a case. I’d already sung your praises to my sisters, neighbors and friends. I even had strangers knock on my door and ask what I used to feed my plants. Of course, I told them about Beat Your Neighbor.